One Adventure Ends, Another Begins - Everything Husky! Siberian Huskies are known for their sense of adventure, and many new owners who buy one for their beauty are ill-prepared to deal with the fact that their dog is an escape artist and not good at obeying commands. 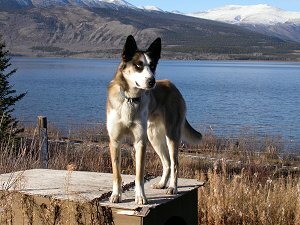 Though Kodi's puppy year-and-a-half was spent in a pen in a city back yard, upon moving to the Yukon Territory his life became one adventure after another (click here to read about his early life). 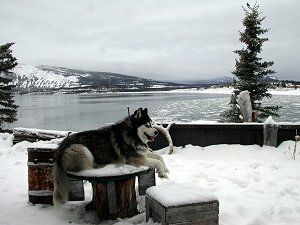 Some dogs focus on food, some on comfort; Kodi would give up both food and comfort for an adventure, and the more extreme it was, the better he liked it. Highly intelligent, he made my job of keeping him contained in a 70x70-foot pen a constant contest between us. As I fixed one weak spot, he'd already have his eye on another, and the way he looked at me made his thoughts clear - "I can still get out of here, you know!". On August 25, 2003, Kodi went on his final adventure. At the 5,500-foot level of Montana Mountain, he jumped out of the back of our pickup truck when I stopped it, leaving Kayla and I behind. 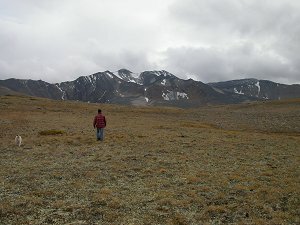 He headed uphill across the tundra, running hard to intercept a young bull caribou that we had seen a few minutes before. I never saw Kodi again. I looked for him on our way down the mountain an hour or so later, but fully expected to find him waiting for us at our cabin at the base of the mountain as he'd done several times before. He knew the mountain intimately, and a 12-mile cross-country run was not a big deal to a bush-smart boy in his condition. Kayla and I spent the entire week combing the large and extremely rugged mountain for him, by truck and on foot. Every valley, every ravine, the bottom of every snowslide was searched, with no luck. Posters with his photo on them were put up in the communities, along the highway and at the border crossing into Alaska, all to no avail. I know that many people think that I give my huskies too much freedom, and that Kodi would still be with me if I had kept him on a leash. Perhaps, but I'm a firm believer in the concept that quality of life is far more important that quantity. Kodi was on a leash when we were around people and traffic, but he died the same way I want to - not in bed of old age, but out savouring the incredible wilderness that surrounds us. Christmas is fast approaching as I write this. I've tried many times over the past 4 months to put my feelings down, but tears always force me to stop. It's become important to me to succeed this time, though I'm not sure why. Perhaps it's because I'm not only saying goodbye to a truly remarkable dog, I'm also welcoming a new boy into my family - a boy whose life I would have probably not been able to save if I already had two dogs, because I wouldn't have heard about him. Kayla took the loss of her life-long partner very hard. The sparkle had left her eyes, and she had no real interest in doing anything. 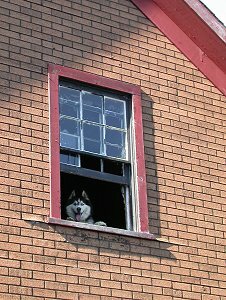 Seeing her so deeply depressed made the situation even more difficult, and I soon began the search for another husky who needed me. 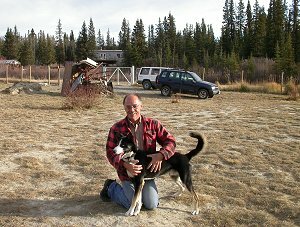 The Humane Society of the Yukon has a few volunteers who take dogs out to a fenced acreage for runs, and that venue is a great opportunity to see how dogs interact. The photo to the right shows me at one of the runs with Chum, a little guy whose "growling" voice I loved. 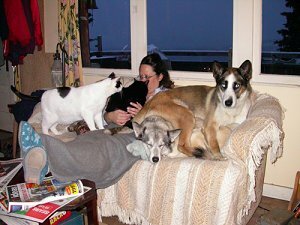 I believe that adopting a husky is a two-way decision, that the dog picks you as much as you pick them, and when I went into his cage, Chum cuddled right up and talked to me as if asking if he could come home with me. While Chum and Skijour, a big loveable guy, were still holding my attention, though, another hard-luck Alaskan husky arrived at the shelter. I got permission to visit Monty in the quarantine area where new residents are kept, and heard his sad story. He had just escaped being euthanised by seconds the day before, when the vets assigned to do it saw that special "something" and decided to call the Humane Society instead. The needle was actually in his leg when that decision was made. Monty tried his best to convince me that he would be a good addition to my family, and it worked. It certainly wasn't a quick decision, as I weighed all of the possibilities, and at one point I convinced myself that one dog was enough. The first time Monty went on a leash-walk outside the shelter with me changed my mind - although it was clear that he had no idea what a leash was, it was just as clear that he was a very quick learner, and really wanted to please me. Five minutes later, on October 28th, I signed the adoption papers and Monty began his new life. We've had a rough couple of months due to a series of problems that started with a cyst that developed as a reaction to a vaccination. I often wonder why Monty still trusts me, but he seems to know that the sometimes-painful trips to the vet have been needed. Getting to sleep on the bed with me seems to have been all the reassurance he needed. On December 15th I cut his bandages off for the last time, and on the 24th his stitches come out - what better present could I get on Christmas Eve than a healthy puppy? Monty has turned out to be the most perfect addition to my family that I could have hoped for. "Devoted" isn't a term often heard when describing huskies, but it's the only word that properly describes his relationship with me. Kayla is perhaps the one who has gained the most from Monty's arrival, though - she is back to being an extremely happy dog who just loves to play, and when it comes time to cuddle, she and her new brother make quite a pair! In a couple of weeks, we'll find out if they team as well in harness. During the worst period of Monty's health problems, I joked to the vet that this was all a test by the Husky God to see if we deserved Monty. We apparently passed the test - and he truly is a gift. "Monty the Magnificent" is maturing beautifully, having become an excellent working partner in harness while still keeping his cuddly nature. Last week he got his first job on the Web, having been requested to serve as the mascot of LiberalWatchDogs (now defunct), a group trying to clean up abuses within the Canadian Liberal Party. They used the photo seen second from the bottom of this page. As you can see by his strong gaze, it's a job he takes seriously!